For decades Fuertventura has been a winter haven for surfers, windsurfers and more recently kitesurfers. Of late, however, there’s a new breed of watersports enthusiast hitting the island: stand up paddlers. All the Canary Islands enjoy a rep for world class waves but in addition, and something often overlooked, are the abundance of flat water paddling spots. Add in a healthy amount of downwind runs and what you end up with is an all round destination for paddling fun with off season sun in the mix. But where to base yourself? For us, during a recent late winter trip, that decision was easy. Flag Beach Watersports has been a focal point on the island since the mid-80s. 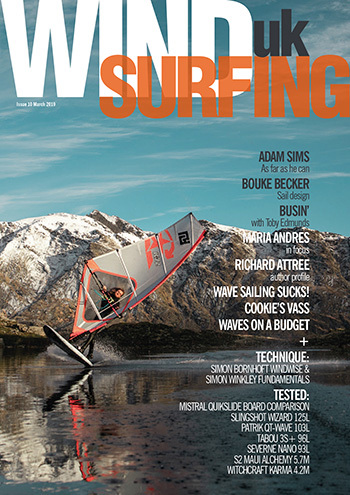 Ben Thomas set up the as then beach shack having discovered Flag Beach’s windsurfing benefits. These days all manner of water baby make the pilgrimage to Flag with SUP being added in the last few years. Flag itself, when not breezy, offers picture postcard paddling atop bubble gum blue water. If there’s a degree of swell then reefs to the left, and in the middle of the bay, offer doable non-life threatening waves to hone skills. Head across to Lobos Island in the (short) distance and more in the way of idyllic lagoons are available to cruise and/or practice a bit of Yoga if needs arise. Flag Beach Watersports’ crew run tours across the channel with instructors/guides to ensure you enjoy your time on Lobos. For anyone visiting the island then we’d suggest staying in and around Corralejo to maximise your brine time at Flag. A short drive, ten minute cycle or slightly longer stroll will have you at Flag’s launch, primed and ready to go. 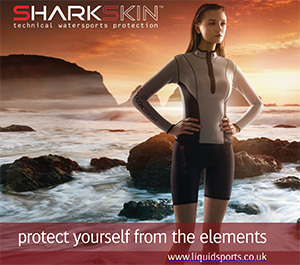 With a choice of Fanatic SUPs and paddles there’s everything available to get you up and running – beginners also welcome. During our stay we had a real mix of conditions. As is usual in winter there was plenty of swell. Wind was also a feature at times. Fortunately Ben allowed us to take stand up paddle gear offsite to hit alternative spots. Just along the coast, back towards the centre of Corralejo town, is Rocky Point. RP is a serious wave at size, with bombs swooping onto the reef ledge and unloading quite a way out. With a solid pulse in the mix, and light onshores at the beginning of our trip, this was an easy choice for some fun wave riding. Add the fact Waikiki beach is a sandy toddler friendly spot, with Rockies just a short paddle downwind, and you couldn’t ask for better. Leaving the fam to frolic in the calm waters of the harbour sweeping towards Rocky Point allows familiarisation. When a big set swings in you can spot it looming miles out and stand in awe as it jacks and unloads right out back. For those fortunate enough to be in prime position then a long walling right or left rifles down the point. The right is better (the clue’s in the name) although lefts can also open up and be good. Having assessed the situation getting to the take off is pretty easy. Even though it’s a relatively deep water reef you can still see the bottom at Rockies. And take it from me, if a big one unloads on your swede, or you stack a take off, then it’s Davey Jones’ Locker hunting you go, touching the reef in the process. That said, while you still need to be careful, injury is rare and Rocky Point is a pretty none life threatening spot to paddle surf. In fact, the walling swell is ideal for sweeping action. (Note: you can also paddle to the take off from the residential area directly in front of Rockies avoiding any white water). During the first few days of our stay winds were light and the swell was solid. Having been to Fuerte in the past I hadn’t considered that with big surf the reefs inside the harbour can come alive. As such you may strike it lucky and discover this for yourself. Although the Waikiki reefs were smaller than Rocky Point there was a still a fun waist to chest high wave to be nabbed. And while busy (to be expected with such close proximately to Corralejo town) the vibe in the water was relaxed with the majority of riders being paddlers – sit downs and stand ups. Heading across to the widely known (and infamous) northern track put ins the swell was even bigger. Unfortunately there was breeze in the mix and most spots didn’t look favourable for paddle surfing. 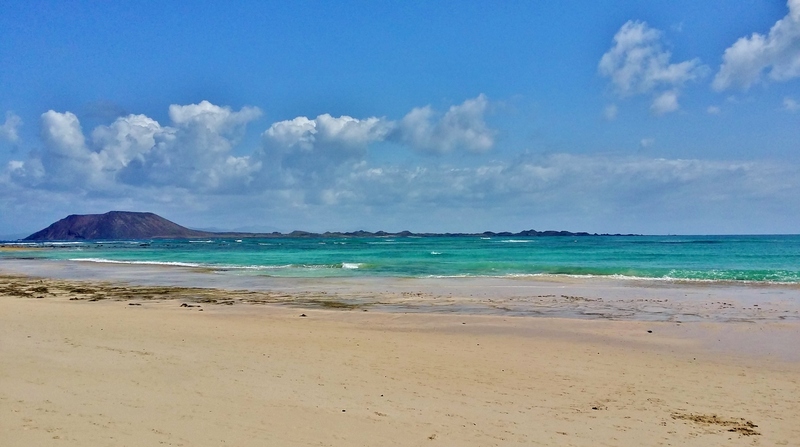 A few locations offer shelter in the form of tidal lagoons with reef protecting from the relentless pounding of the Atlantic, but still being breezy this idea was abandoned in favour of Corralejo’s coast, once again, where it wasn’t as blowy. As time wore on the Passat (local name for the NE wind) continued to increase with gusts becoming ever fiercer. For those who fancy a spot of downwind paddling action there’s certainly the option on Fuerte. And on a few occasions a number of paddlers could be seen from land cruising bumps past the harbour down to Flag. If you fancy a bit of this then riders will need to take their own gear as we didn’t spot any outlet offering the right equipment. 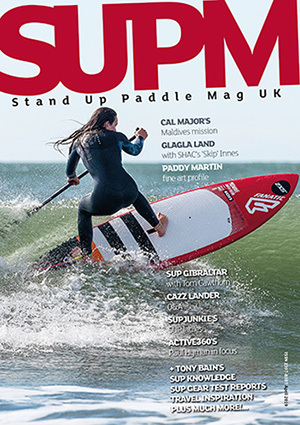 Of course, you can downwind on any SUP (in theory) but for the types of bump you’ll encounter in the Canaries a proper SUP, built for the job in hand, would be better. For us, increasing gusts signalled to the time to switch sports and windsurfing was the order of the day, again, well catered for by the Flag Beach centre. Those initial few days of SUP action had been cracking, however, and Fuerte as a SUP destination is certainly worth a look. If, like us, you want to combine disciplines then Flag Beach Watersports will certainly be able to sort you out. And with the Canaries being super easy to get to from the UK it’s worth a punt whatever the time of year.